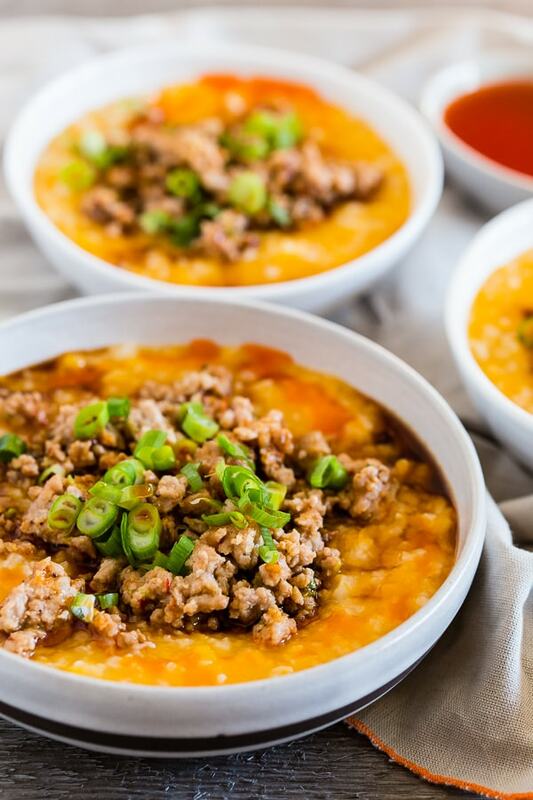 This pressure cooker butternut squash congee is topped with ground pork flavored with ginger, lemongrass, garlic, soy sauce and hot chili oil. This dish is 100% comfort food and can be enjoyed for breakfast, lunch or dinner. You’ll love that it’s ready in just 30 minutes by using your pressure cooker or Instant Pot. OMG YOU GUYS! I finally busted out my Instant Pot and I’m in love. I know EVERYONE and their sister has an Instant Pot and now I do too! I actually bought mine a few months ago and used it a few times and then sorta forgot I owned it. I KNOW! Who am I? Who buys an appliance and then just forgets they own it? Well, me apparently. Then I went to Chile in December and let my friend borrow my Instant Pot and after she told me all the food she made I knew I needed to bust it out again. One of the dishes she told me she made was congee and I was 100% intrigued. My only time seeing congee in person has been on cruise ships. I usually walk right past it with a side eye glance and a thought of “what in the heck is that stuff?” Well, let me tell you something – THIS STUFF IS GOLD! 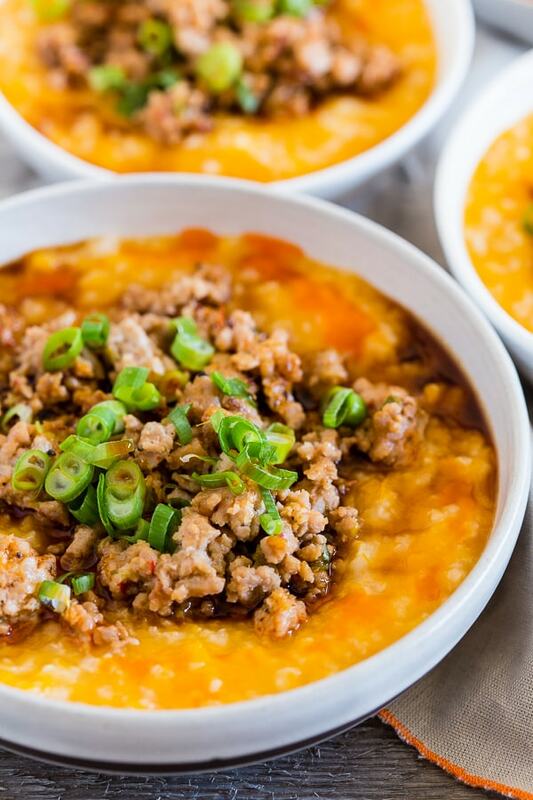 Even though I liked the pressure cooker butternut squash congee straight out of the cooker I LOVED it when topped with my super spiced ground pork mixture. I packed a lot of flavor in this ground pork and it’s exactly what gives this congee a big hit of flavor. To top it all off a little extra drizzle of low sodium soy sauce and hot chili oil is all it needs! Of course, you can opt out of the hot chili oil if you’re not a heat fan but it’s SOOOOOO GOOD! The same goes for the addition of the chili garlic paste. Feel free to adjust the ingredients based on your love of HEAT! Or your non-love of heat. Also, don’t worry if you don’t have a pressure cooker or Instant Pot I’m also giving you instructions on how to do this dish in the slow cooker! 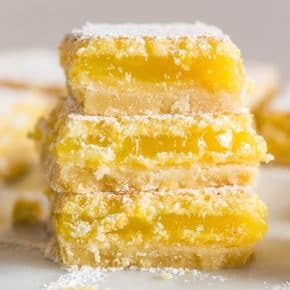 OHHHHHHHHH and this recipe can be doubled PERFECTLY! 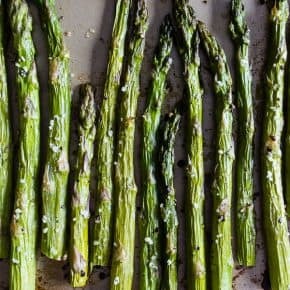 Looking for other Asian inspired recipes? 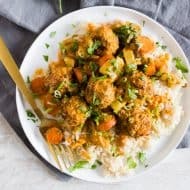 Try my 20 Minute Beef Snow Pea Skillet, Healthier General Tsos Chicken, Spicy Garlic Pork Stir Fry, Chicken Apricot Coconut Curry, 20 Minute Healthier Orange Chicken, Slow Cooker Honey Soy Sriracha Pulled Chicken, Soy Sriracha Deviled Eggs or my Kimchi Fried Rice. 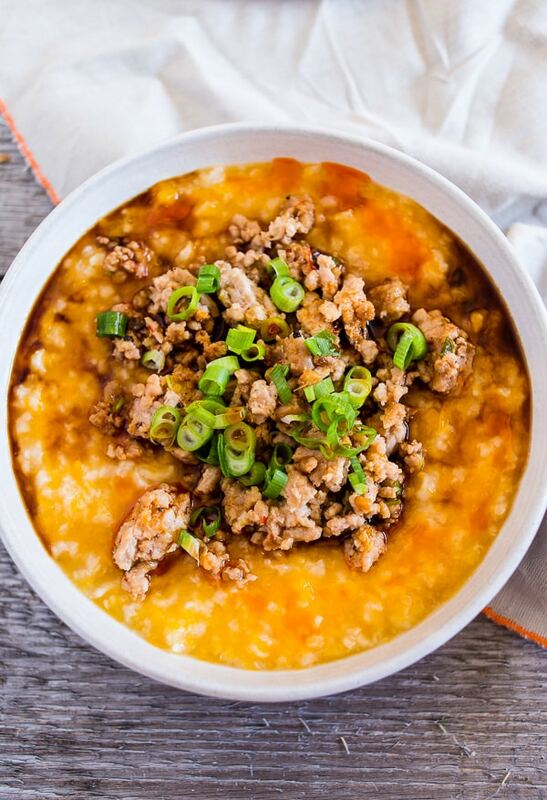 This pressure cooker butternut squash congee is topped with ground pork flavored with ginger, lemongrass, garlic, soy sauce and hot chili oil. This dish is 100% comfort food and can be enjoyed for breakfast, lunch or dinner. 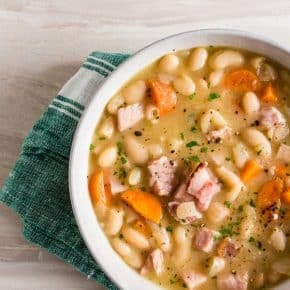 You'll love that it's ready in just 30 minutes by using your pressure cooker or Instant Pot. In your electric pressure cooker or Instant Pot add stock, squash, rice and ginger. Stir to combine. If you're using an electric pressure cooker add put it on high pressure for 20 minutes OR if you're using an Instant Pot put it on the porridge setting. You can natural release or quick release. If I'm still cooking my pork mixture when the congee is done I let it natural release and then quick release if I want it right away. After the lid unseals stir your congee and slightly mash the squash so it combines. I find a hand held potato masher works well to help mash the squash. Serve hot and top with pork and other optional toppings. Add olive oil to a large skillet and set over medium-high heat. Add all other ingredients and cook until the meat is browned and fragrant. Spoon congee into a bowl, top with a hearty spoonful of pork mixture and top with a drizzle of soy sauce, hot chili oil and sliced green onions. 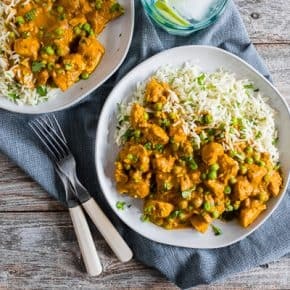 Add all ingredients to your slow cooker and cook on low for 8 hours or high for 4 hours or until the rice is broken down and mixture is creamy. Note: Be careful if you add salt to the congee and meat mixture. You will have additional salt added to the mixture when you cook the rice in the stock and when you top with soy sauce. First, this looks so pretty! Now…I have had Congee before made by Chinese cooks (a friend is married to a Chinese woman and they have a cook from China). I think traditional Congee is tasteless…Blech! They say its good for you…yada, yada. BUT…YOURS??? That had flavor and depth and butternut squash…hello! I am all over this, brilliant! 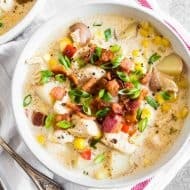 I am obsessed with my Instant Pot and this sounds like a delicious way to use it! Omg I have GOT to get on the Instant Pot train! I wish I had more storage space in my house! Glad to have instructions for this for the slow cooker – yay! – because it looks delicious. 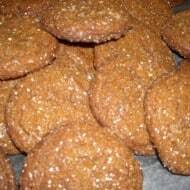 I’d love this for breakfast (and dinner)! 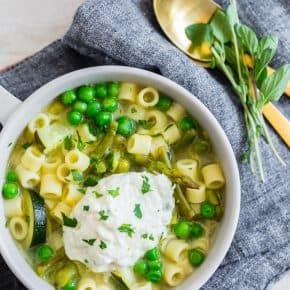 I’ve been cooking with my Instant Pot SO MUCH over the past few weeks, and now have another recipe to add to the list. 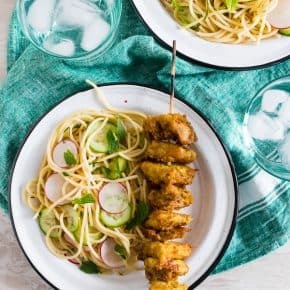 Love the lemongrass flavors in this! Ok, so now I have to get an Instant Pot! 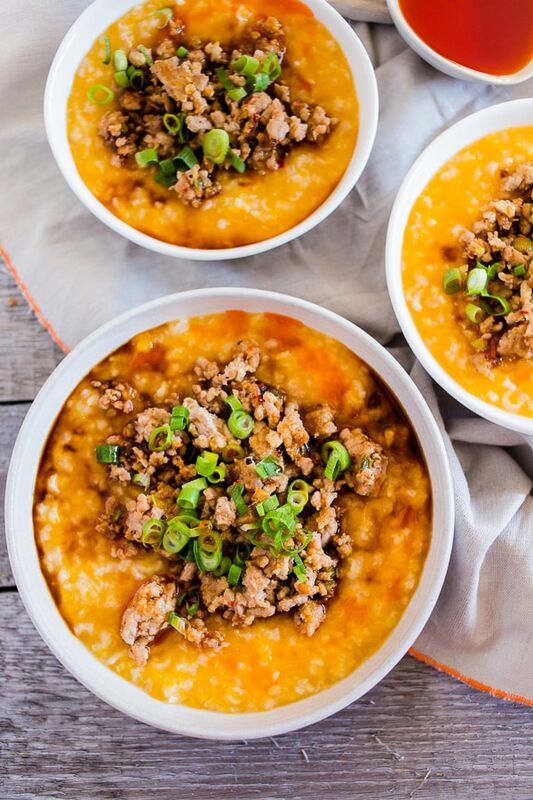 This congee looks so darn good. I love every thing about it! Oooh, that looks so satisfying and flavorful! I still haven’t tried out an Instant Pot but I really need to! Wow!! What an incredible dish!! You went to Chile?! Whaaat! Lucky. And I feel like the last person to not have an InstantPot. I need to get one already! oh my gosh, I thought it was covered in cheese!!! I love that it’s vegetables instead!! 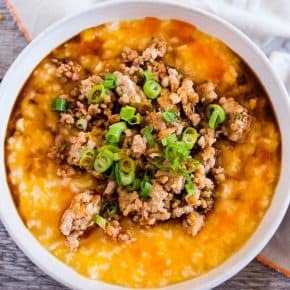 I’ve never had Congee and I need an instant pot asap! Love how you made butternut squash soup so hearty and perfect! Wow!! Just what an amazing meal!! That looks so satisfying and also tasty. I still haven’t tried out an Instant Pot yet I actually should! I’ve heard such great things about instant pots! I haven’t bought one yet, but I should look into it!